Ships today—even the massive likes of the Emma Maersk and Marco Polo—just aren't big enough to handle the demands of globalized trade. 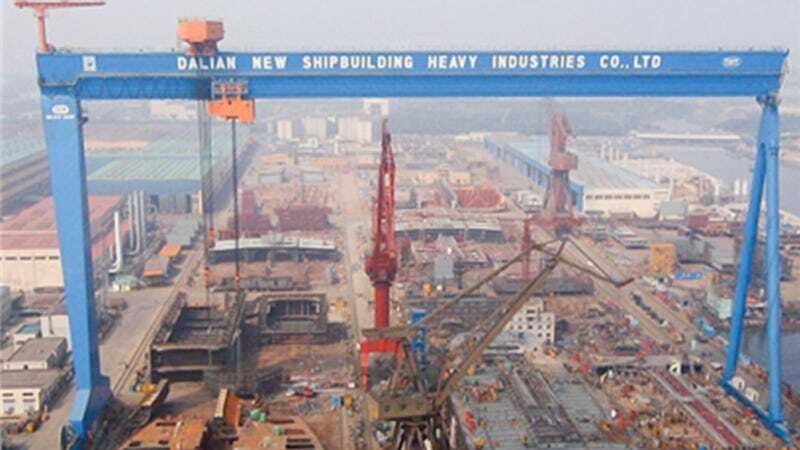 So to quickly and safely build the next generation of super-sized LNG tankers and container vessels, China's Dalian shipyard relies on GE's staggeringly-huge, laser-guided Goliath gantry crane. The Goliath gantry measures 650 feet wide and 320 feet high—large enough to fit Giants Stadium between its legs—and weighs a stout 4,000 tons. Riding atop the cross member are a pair of automated gantry cranes, each capable of hoisting 600 tons. What's more, the crane trolleys operate under a laser-guided anti-collision system developed by GE Power Conversion. This master-slave configuration allows a single operator to control both cranes simultaneously, not only eliminating the dangers of two operators working in such close proximity but also improving efficiency. The electric hoisting motors also incorporate an ingenious energy recuperation system similar to the regenerative brakes used in hybrid cars. The system converts the gravitational force exerted while lowering a heavy load into electric current that's fed back to the system for use lifting other loads. The regenerative system is reportedly 80 percent efficient. “We've developed an energy balancing system that allows the operator to use as little power as possible,” Lutz Steinhaus, global sales and engineering application leader at GE Power Conversion, said in a press statement. “One trolley lowering a load can provide power to the other." The Goliath crane incorporates an active power management system that delivers and controls the amount of power to individual motors and gears to optimize the crane's power consumption. “Few people know that GE builds brains for big cranes,” Steinhaus continued. In addition, an automatic skew control system (ASCS) regulation software to prevent lifted parts from twisting in the wind, and a unified data reporting suite that combines previously separated hardware and software controls for the crane and motor functions into a single operator UI. With 20 of these gigantic gantries already at work in shipyards around the world, we'll be able to slap together truly mammoth ships in short order.